Rugby Town go into their three-game Christmas and New Year schedule still very much in trouble at the foot of the Evostik NPL South Division. Last Saturday’s 2-1 home defeat to Lincoln meant that with half of their league fixtures now played, Valley have accumulated just 12 points and still lie two adrift of 21st placed Loughborough – who also lost at the weekend. Boxing Day sees the visit of local rivals Bedworth to Butlin Road and Gary Moran’s side will be looking to avenge for the FA Trophy replay defeat at Town’s home ground earlier in the season. Rugby looked to be cruising towards a rare victory in that competition at the Oval, before the Greenbacks clawed back a three goal deficit and then went on to ease to a 2-0 victory in the midweek replay. Of the 11 that started that evening little more than two months ago, not one of them subsequently took the field for kick-off against Lincoln at the weekend, as Moran continues to search for a consistent winning formula. Three more players – Warren Brooks, Trey Brathwaite and Jarrell Hylton - made their Town competitive debuts in this latest reverse, with a fourth – Callum Burgess – also back in a Valley shirt for a second spell after the defender signed from Coventry United. Brooks and Brathwaite teamed up with Mitchell Thomson in a midfield three following their dual registration signing from Moran’s old club Stratford, whilst Hylton finally featured from the bench after missing out through injury since joining from Coventry Sphinx last month. 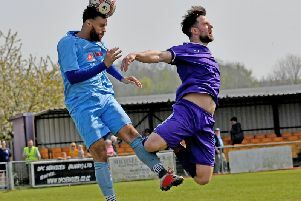 Burgess impressed during his short stay at Butlin Road back in 2010, before leaving for then-Conference side Hinckley, whilst Brathwaite was part of Gary Mills’ pre-season squad last year. Also returning to the club is keeper Louis Connor, following a brief (and torrid) spell at Corby. Connor was in great form for Rugby at the start of the season, but left to join Mills’ new charges at Steel Park just over a month ago. He was named on the bench against Lincoln though, as ex-Walsall youngster Dan Jezeph kept his place in the team for the game. Following on from the Boxing Day local derby, Town then travel to Stamford on Friday, December 30 for a 7.45pm kick-off, before completing their festive fixture diary with another away game at Carlton on (Bank Holiday) Monday, January 2 afternoon. Bedworth moved up into 14th place in the table following their 3-0 home win over Kidsgrove last Saturday, where they put out a side that contained ex-Valley men Richard Blythe, Nathan Haines and Marcel Simpson, although another one-time Rugby favourite Justin Marsden recently departed the Oval to join up with Stratford. # The club coaches to Stamford next Friday and Carlton the following Monday will leave Butlin Road at 5.15 pm and 12 noon respectively. For latest information on these, contact Tony Mann on 07970 691366. # Tony is also responsible for the club’s contribution to the Hope4 local charity appeal for the homeless and badly-housed people of Rugby. The appeal collects non-perishable and tinned food items, and Tony looked to the club’s supporters to continue with their generosity.